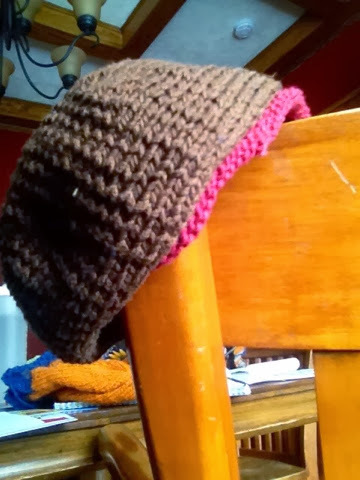 The first pattern is this Icelandic Winter Cap. I loved my personal version of this design to death! It is now felted with snow and hard use and battered and perfect for my boys' basement toy box, but still warm. 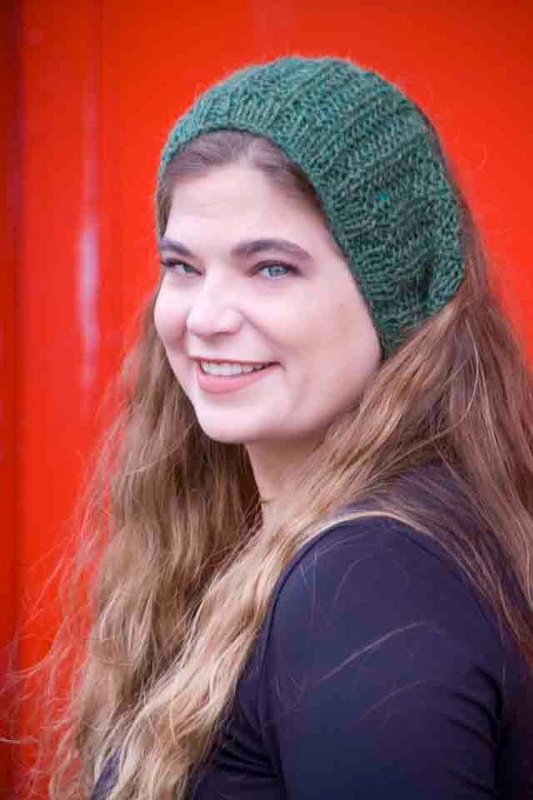 It knits up quickly with Lopi yarns and is an inexpensive boost to your winter wardrobe...covers your ears, too! The next photo is of the Sit Upon. This is my only crochet pattern in print. 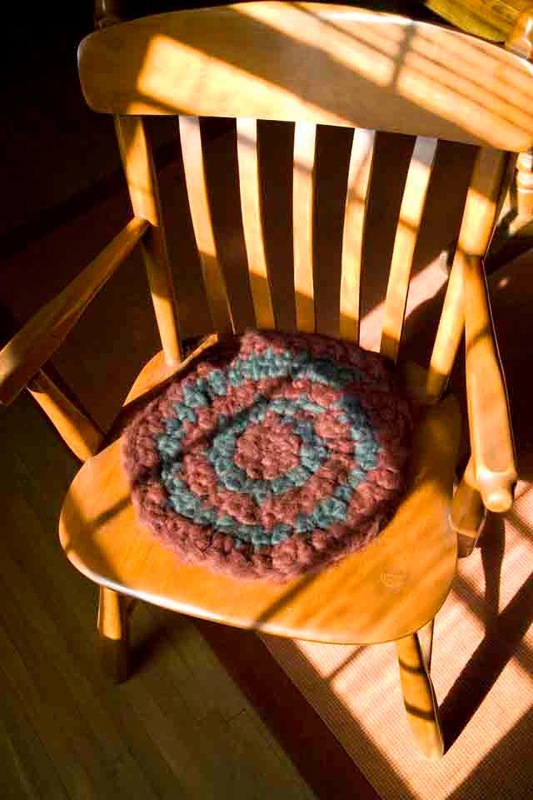 Made quickly with an enormous crochet hook and wool roving, these sit upons can warm up a bleacher seat or dress up your dining room. It all depends on where you need it! One of my Sit Upons actually works as a placemat underneath my dogs' water bowl. It is a versatile and useful thing to have, and very fast to make. 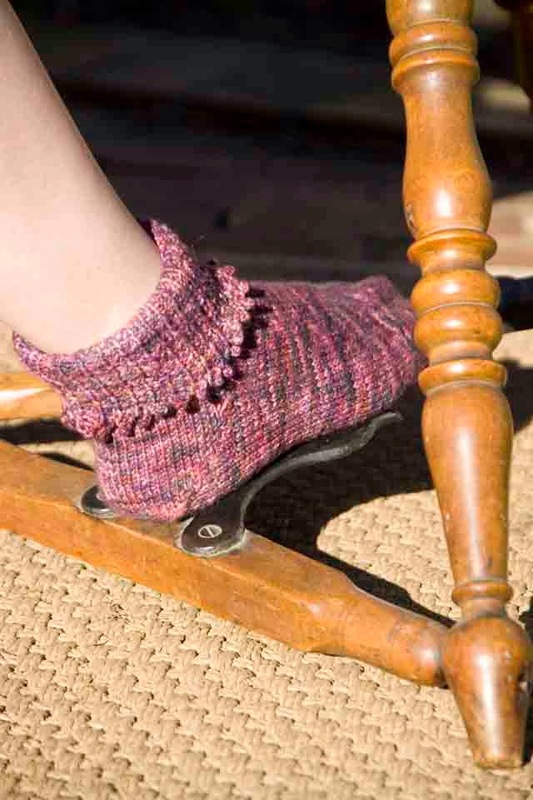 The Mary Jane Socks, a pattern featured in an earlier blog post, are an ideal way to use one of a kind hand-dyed sock yarns. Assuming all the stars align, I hope to feature a brand new version of this pattern in a special new hand-dyed yarn line. In the meanwhile though, the pattern is now available as a download, too! The Deep V Sweater is an interesting pattern and I'm surprised I have not seen more versions of it posted online. Knit with two strands of cotton yarn, it can be knit with either two strands worsted weight or one strand bulky weight yarn. It's designed to keep the chill away, whether you're at a festival or at home. I look forward to seeing more versions of this pop up on line now that the pdf is available. 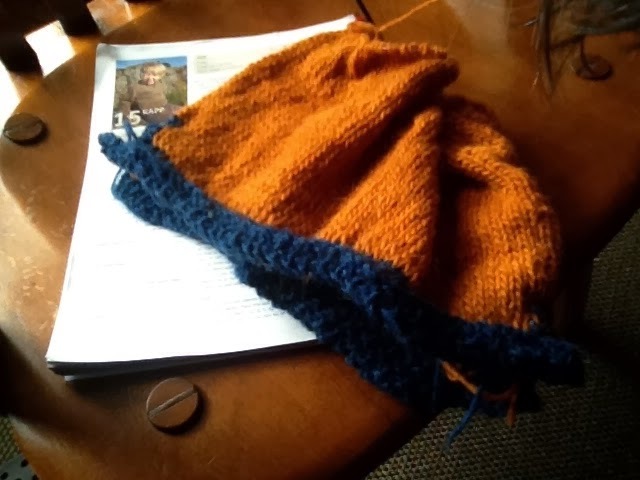 The last pdf from Fiber Gathering that is now available as a separate download is the Unmistakably Warm Cowl. I am featuring a photo of this one that shows it around the ears, but it is, of course, also good for your neck! 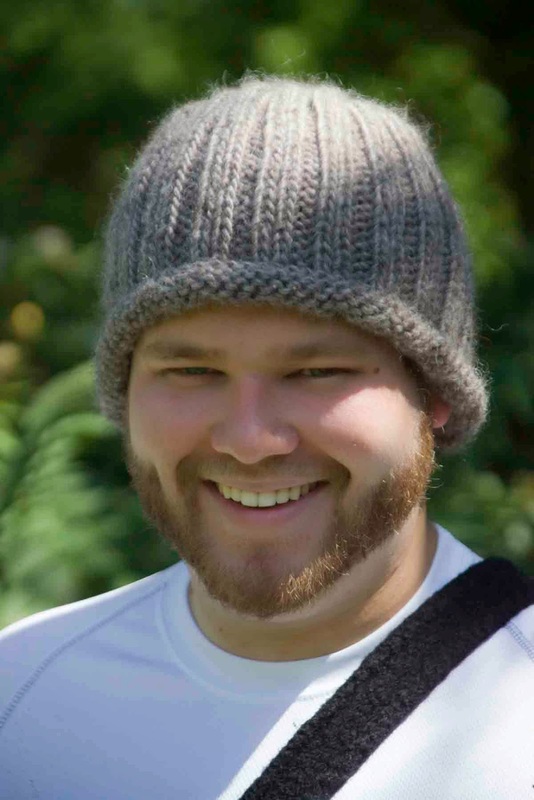 When I knit this out of lighter weight alpaca, I was living in Kentucky and it seemed mighty warm. I won't lie, this version is not warm enough for Winnipeg winters (but then, very little is!) --if I were to make this for wear here in Winnipeg, I'd make it out of worsted weight or bulky weight alpaca, and I'd make a bigger cowl, too. 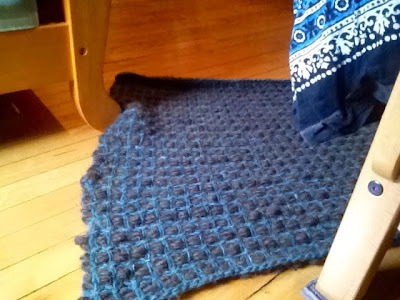 The good thing about this pattern is that it is easy to modify and very fast to make. I am excited about being able to market these patterns separately! Several blog readers have either posted comments or mentioned privately that they think this is great too--thank you so much for the moral support. I am really hoping that making these patterns available individually will offer knitters more options to enjoy knitting these designs. As one friend explained, she already has my book, but would love to just have the convenience of a single pattern at a time--no scrolling through an ebook--available on her iPad in her knitting bag. Here it is, friends! Thanks for your kind words and support! Oh yes. I have to knit, in some small way, even if I am not designing. I find a moment or two at a time and I never get an hour at a stretch like I did pre-twins. I need the knitting. It is necessary just to keep sane! Lately, I have been on an Icelandic wool kick. 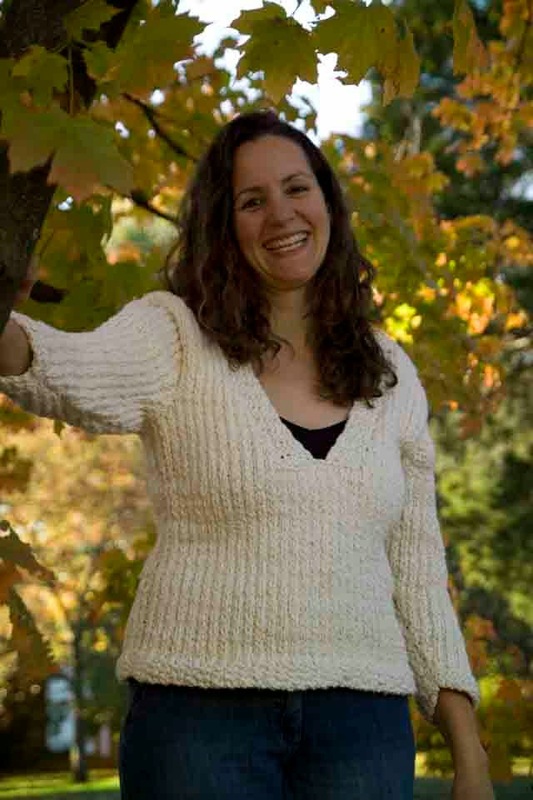 This first photo is a size 4 sweater made of lett-lopi. The boys will sit next to me on the couch, drinking their milk before bedtime. We watch Caillou or Curious George (Thomas, Busytown Mysteries and Sesame Street, too) and I am working on a sweater for them. They still share everything so both are excited about this one. It's called Kapp and is from a Lopi Pattern book. #31, I think. When the boys turn three, each of them will start wearing a kipah (yamulka) at their Jewish preschool. I am making those now, and perhaps will come up with a kid kipah pattern, too...These are designed to fit more like a beanie so that they don't fly off when busy boys are playing. I am planning to make four so we have a back up for each kid in case one gets wet or dirty or gets lost. 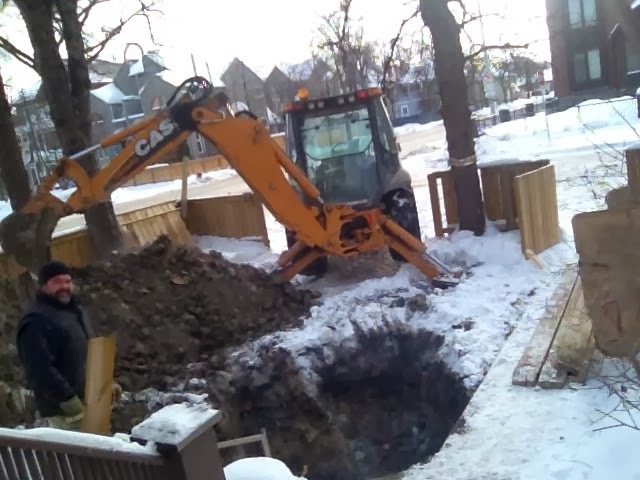 On the plumbing front, today the basement floor was covered again in concrete, so we do not have any gaping holes or dirt piles left inside. 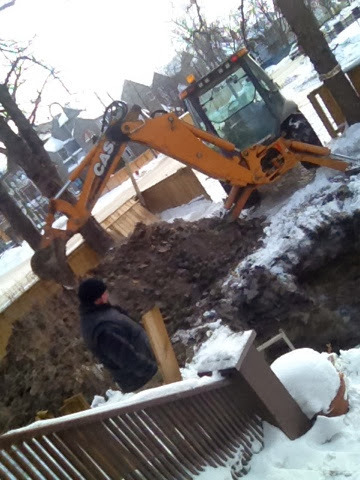 Outside, we'll have a huge pile of dirt to move, some landscaping, and fence to repair, come spring when the ground warms up enough to put a fence post in. 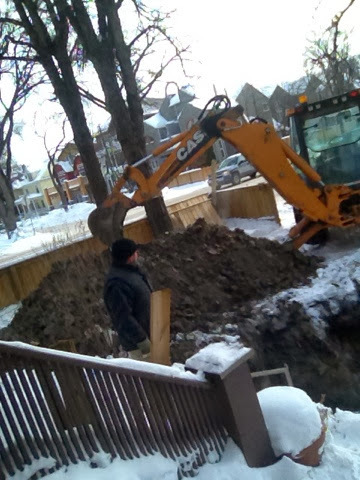 However, we have a new sewer line now, and flushing is a really really good thing. All this was slightly complicated by the fact that both of the twins had a virus with a low fever, so yesterday was a "stay at home" day where we missed preschool. The day before, we missed swim class, so this was serious! Today, they were a little better and I packed them off to preschool so I didn't have to worry about having them fall down a hole, indoors or out, in their excitement over diggers and plumbers.